Prototype: Mitsui Rail Capital Europe (MRCE) class 185.1 electric locomotive, a DB AG type Res 2 flat car, and an ermewa type Rils sliding tarp car. The train looks as it did around 2012. Model: The locomotive frame is constructed of die-cast metal. The locomotive has a DCC/Selectrix decoder with a sound generator. It also has a 5-pole motor with two (2) flywheels. The locomotive has a close coupler mechanism. The headlights and marker lights change over with the direction of travel. 4 axles powered. Traction tires. The cars have close coupler mechanisms. Total train length 282 mm / 11-1/8". 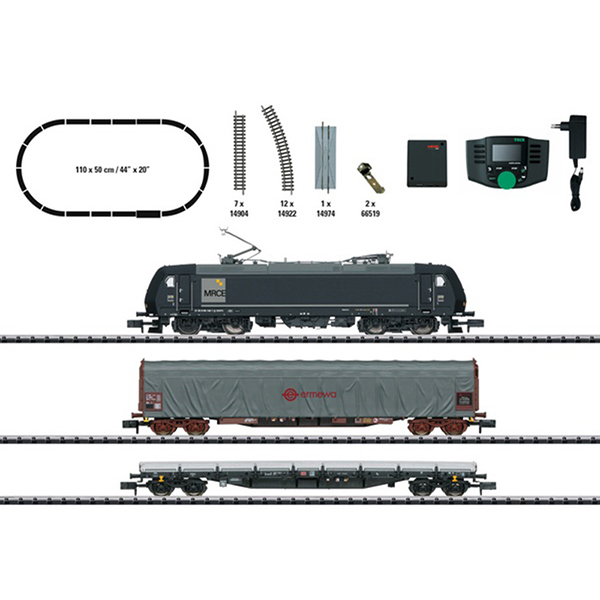 A Mobile Station, a track connector box, a 36 VA / 230 volt switched mode power pack, and an oval of track with Radius 2 curved track are included. Space required: 110 x 50 cm / 44" x 20". Total length over the buffers for the train approximately 366 mm / 14-3/8". Locomotive includes a DCC decoder. Can be expanded with the entire Minitrix track program.